At times, your application is just a tiny little step in a long business process. Even given that the application under test had been tested properly according to whatever testing approach you choose – there might be the situation where the scope of the process is way beyond the scope of your team. I know, you have a time slot in your sprints to properly test dependency, but does it suffice to test the really relevant stuff? In some contexts, the typical staffing to test these kinds of processes would be to ask business experts to execute the tests. Most SAP projects would involve the business units for testing – up to the point that they almost do all the testing. But there are other projects where it has been decided, that the support of the business units would be of benefit to the test. Is it? From my experience, the success of integration of external testers from the business units heavily depends on the support they get. Remember: They are experts in business, and not in testing. And they also might not yet understand the new features to be tested. There is a reason why they are not part of the teams: they usually never have enough time to be spent on testing as they also have their “normal” job to do. It therefore is mandatory to give them all the support they need to make it efficient and gain an overall positive experience. 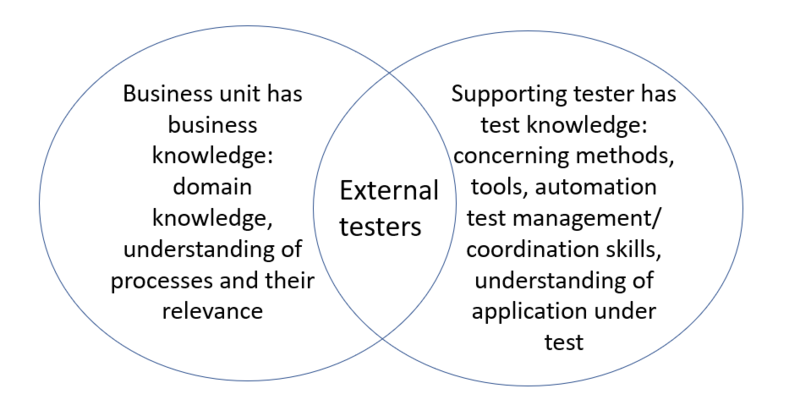 Very often a tester/test manager would be the right person to take care of the external testers. Her task is to understand, from which experience level the external testers start and how she can support. At the start of whatever testing initiative, the external testers often do not know what to expect. They are insecure and sometimes overwhelmed to begin with. In this situation it is important to create a warm welcome, explain what will need to be done, what the expectations are and what kind of support will be given. Also, all kinds of organizational issues from coffee supply via rules of communication to testing schedules need to be clarified in order to create a safe environment. At times it might be important to involve change management experts to show the external testers the purpose and roadmap of the application to test. Only now, their mind can be open to receive training of the application under test (or the new features) in order to be able to use the app and the features that the tester thinks are relevant. At this point in time, also the tools to be used for the testing process (like a bug tracking tool) should be introduced. As tester you can support this step by providing a stable test environment and – even more important: test data that are similar to reality. In an ideal world, the test master data are an exact copy of the real data so that the external testers can “feel at home” and relate to their own business. At this point in time, the external tester will only stumble across very obvious bugs – those that should have been caught before! Therefore, the tester has to take actions to foster the transfer. Using their business knowledge, the external testers will automatically start to transfer their application knowledge to start testing their day to day business tasks. As tester you should coordinate these efforts so that they don’t end up doing all the same tasks. You should point out areas to look into and also challenge the external testers to think more in a negative way. Most of the time, the external testers are used to avoid bugs in their use of applications – now you have to help them to find the bugs. Another task of the tester at this level will be to help the external testers use the application and the testing tools. Now, the external testers will find the bugs that impact the most relevant activities during the daily business. But those are not necessarily the ones that are most at risk. 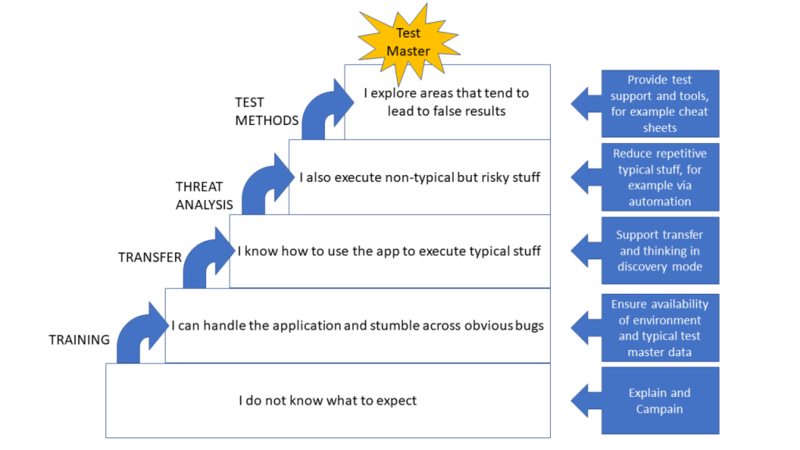 Using some kind of risk analysis approach, the tester needs to help the external testers to also focus on activities that might not be that common but would pose a high threat in case of failure. At this stage of testing this very often involves some discussion around processes happening infrequently but with summarizing effect or processes with many dependencies. These discussions should be led with a strong focus on business perspective. In order to free the external testers to now focus on specific threats, it would be helpful if the tester could ensure automation of the day to day business tasks. Also, she can support in supply of specific test data for the specific test situations. The external testers now already have covered a lot of the situations to be tested, but often still very much depend on the support of the tester. The tester would want to help them to be independent. In order to get the external testers to work independently, the tester has to share knowledge about testing methods. In my experience the most relevant knowledge is about how to do proper exploratory testing. As a basis for this, cheat sheets could be supplied, but also the approach needs to be explained. The most important additional ability the external testers needs to apply is that they themselves can search for improper behavior. As a prerequisite for overall success in this level, the environment and test data have to be available and the standard stuff should be automated. The creation of proper test scripts out of the collected knowledge can help to make the tests repeatable, and, if needed to be included in regression testing. As the external testers usually do not know how to write test cases, the tester could help out here. After all these steps, your external testers have reached a certain test mastery which they can reuse for later stages. As a tester you should make sure that you track all the successful activities you have done to get here, as most likely, there will be other and new external testers becoming part of your team. While the external testing masters obviously could help to support integration of the new test team members, it will be helpful to have documentation to help them to faster take the step to the next level. Can the author Testhexe please complete it? No, but seriously: for whatever reason I forgot to complete the last sentence… done now, thanks for pointing out!